Turkey Rounds Up Thousands Of Military Personnel, But Is The Attempted Coup Over? It's been a long and eventful 24 hours in Turkey. The dust is beginning to settle after the military waged what Turkish officials are calling a coup, causing chaos and unrest in the country. Thousands of military personnel have been detained, leading many to believe Turkey's attempted coup was a failure. But after the uprising, Turkey has a long way to go before things return to normal. 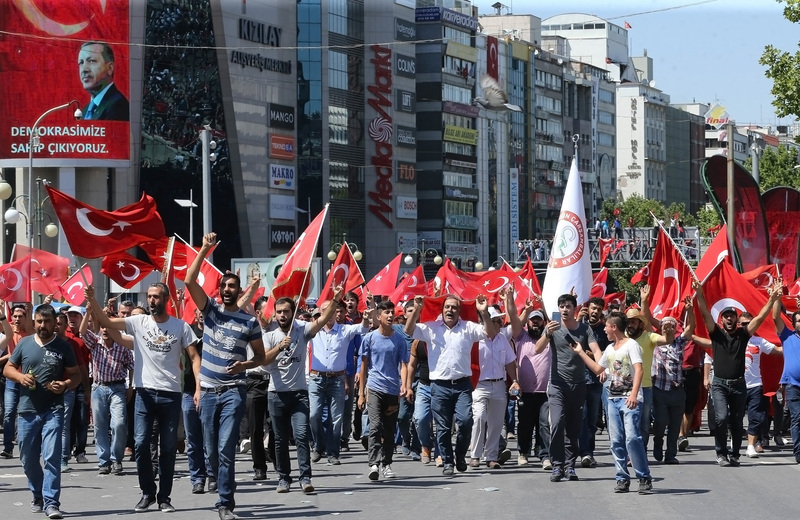 As The New York Times reported, by noon Saturday in Turkey it seems that there were "few signs" that the people leading the coup had viable attempts to challenge the government, which seems to have regained control. Prime Minister Binali Yildirim said that the death toll had risen to 265 — which included police officers, soldiers, civilians, and people involved with the coup — and 1,440 people wounded. He also said that 2,839 military personnel had been detained. The whole debacle began when the military seized control of the government while Turkish President Recep Tayyip Erdogan was traveling abroad. The military also seized control over two bridges, shutting them down. The most violent clashes on Friday and early Saturday happened in Ankara, where warring military branches fought over who had control of several government buildings, including Parliament. Despite the best attempts of Erdogan to work with the military, it seems that history is repeating itself. Turkey has a long history of military intervention in politics. As the Guardian notes, there were three military coups between 1960 and 1980, and the military threatened to intervene in a 2007 election in an attempt to force the government to curb Islamic influences. This latest attempted coup seems to be a response to the rise of Kurdish separatists and the recent bombing in an Istanbul airport and other attacks from extremists. It's unclear at this point how much of a ripple effect this insurgence will have in Turkey. The country straddles Europe and the Middle East, and has been integral in U.S. efforts to combat ISIS. The Turkish military has allowed the United States to use its Incirlik air base to carry out attacks against extremists. Turkey is also a member of NATO, which means that the attempted coup will have international effects.